It’s three a.m. My beautiful baby girl and amazing husband are both sleeping peacefully next to me. What am I still doing up? To be completely honest, tonight I’m letting my anxiety disorder get the best of me. My baby girl has her first illness and that has elevated my anxiety every day to a level I didn’t think was possible! This post won’t be an easy one for me to write, but feels important for me to share. I don’t talk often about my anxiety disorder, mainly because it is still not a well-understood disorder. Even my husband, who knows me better than anyone else in the world, still struggles to understand mine. Before I became a mother, my anxiety disorder was kept at bay by lots of natural calming remedies, occasional medication, and alone/quiet time to collect myself. But now, 5 months postpartum, I’ve realized my only tactic for keeping it at bay has been transferring it onto my baby. Worry over SIDS/accidents/illnesses. This sent me spiraling with anxiety as a new mom! And finally, cry anxiety. Whether it’s being out at dinner and worrying that he/she will begin to cry, or getting tense and anxious during an actual crying fit- this one is a real challenge. Sometimes your newborn may cry and you won’t be able to do a thing about it, no matter how hard you try. Well, anxiety disorder does not take fondly to that situation! If you are a new/expecting mom who suffers from anxiety disorder, let this be your warning. Motherhood will break you, and it will be beautiful. It will always be worth it to put your baby first in your life. You will learn very quickly as a new mother that the beautiful baby you created will take every energy and effort you have in you to care for. You won’t regret a second of it, and you will most likely put their every single need before any need of your own. But, no matter what you do, do not put your anxiety disorder on the back burner. It WILL come back around for you. You still need to take care of you. Always remember, your baby needs YOU. Not an anxiety-ridden, sleep deprived, shell-of-a-person mom. Your baby deserves to have you at the top of your game. And that means taking care of yourself! You need to practice the self-care and self-love that will enable you to be the best mommy you can be to your little one. My personal anxiety in regards to motherhood manifest itself through anxiety dreams/restless nights worrying, micromanaging my husband’s every move with her, being a huge germ-a-phobe, and not enjoying some precious moments with my newborn the way I should have. I’ve found that as I became a mother, I often unnecessarily worsened my own anxiety for myself. I burdened myself with being a perfect mom in every way. By burying myself in endless baby tasks and never giving myself a break. So if you’re battling some of the same things and need some tips to keep yourself together here’s what I have learned so far. Try not to spread yourself too thin. Maybe you fully went into your day expecting to get the dishes done, laundry done, baby’s room cleaned, and the grocery shopping done. But try to remember that some days it will be all you can do to care for yourself and your baby and accept that that is OKAY. Give yourself a minute. When you feel the anxiety setting in, try and take a step back. If possible, let someone else care for the baby for even just 5 minutes while you go lay down, listen to music, or do some lavender aromatherapy. If you are alone with baby make sure their basic needs are cared for (fed,changed) and then try to rest. Lay down with the baby safely next to you, go cuddle them and slowly rock in the rocking chair, or take them for a slow walk in a carrier or stroller so you can take deep breaths and calm yourself. Find a way to have some alone time every day. For me, the only way that’s possible is to stay up a half an hour after my family is asleep, or to wake up half an hour before them. I know what you’re thinking, “not my precious sleep!! !” But this time has been really beneficial for me. It gives me the much needed quiet time where no body needs anything from me. THAT is a beautiful thing as a new mother! New mom anxiety will be different from the anxiety disorder you experienced before your little one came into the world. Your anxiety will no longer be about yourself. It’s a strange thing to transfer your anxiety from yourself to another person. In a lot of ways it may be worse than before. Anxiety makes me think that every tiny thing to every happen to my baby will have long-term negative affects on her. If you find yourself in my shoes remember to tell yourself this: my baby is going to be okay, I’m not going to project my anxiety onto him/her. Now, I’m going to try to set my anxieties aside for the night and get myself the rest I need. I hope that these tips can help you if you too have an anxiety disorder. Always remember, it’s going to be okay mama! I can’t even imagine what you’re going through! 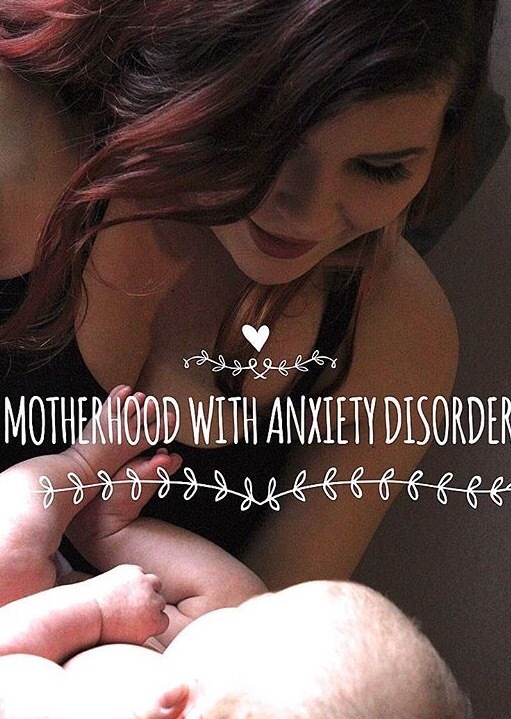 Motherhood is tough enough without an anxiety disorder! Thanks for sharing your coping tips- I feel like they’re helpful to everyone!! You’re so brave to share your story. As a mom who also suffers from anxiety I can totally relate. I understand. 60 years of anxiety and panic attacks. It gets easier but doesn’t go away.